Democrats Draw Line On Medicaid Cuts : Shots - Health News Democrats are worried that cuts to the program will go beyond the impact on the people it serves. It will also affect the Affordable Care Act, which calls for expanding Medicaid to as many as 16 million more people. The states are watching closely because the federal government has promised it will pay most of those additional costs. Sen. Tom Harkin, D-Iowa, speaks Tuesday as Rep. Elijah Cummings, D-Md., Sen. Sheldon Whitehouse, D-R.I., Sen. Al Franken, D-Minn., and Sen. Ben Cardin, D-Md., listen during a news conference on Capitol Hill calling for no reduction in the Medicare and Medicaid budgets as part of the year-end budget talks. At least in public, Republicans have been clear that they see the current budget negotiations as a chance to address what they see as the source of Washington's deficit problem: major entitlement programs. "Medicare and Social Security and Medicaid, if those aren't fixed, if we're not honest about how to fix them, and the fact that, yes, everybody in this country will have to participate in some discomfort if we're going to get out of this hole," said Sen. Tom Coburn, R-Okla., on ABC's This Week last Sunday. But if Republicans have drawn a line in the sand insisting that those major programs be put on the table for negotiation, Democrats are drawing a line of their own. They say Medicaid, which serves the health care needs of some 60 million low-income Americans, needs to be taken off the table. "Any cut in Medicaid will be felt by our most vulnerable," Sen. Ben Cardin, D-Md., said Tuesday at a news conference on Capitol Hill. "We can't let that happen. That's what's at stake." Cardin was joined by nearly a dozen other House and Senate Democrats who urged Democratic negotiators to leave the program alone. Maryland Rep. Chris Van Hollen, the ranking member on the House Budget Committee, said Medicaid is already stretched too thin. "It's stretched so thin that if you stretch it any more you will rip a big hole in that safety net and millions of Americans will fall through and get badly hurt," he said. But Democrats have another reason to worry about the possibility of cuts to Medicaid; one that goes beyond the impact on the people it serves. It has to do with the federal health law, the Affordable Care Act. The law calls for expanding Medicaid to as many as 16 million more people, and the federal government has promised states it will pay most of those additional costs. "One of the questions states have had, and still have, is will Congress keep its promises?" says Matt Salo, executive director of the National Association of Medicaid Directors. Salo is one of many who think that governors deciding whether or not to go ahead with the expansion are watching these budget talks very closely. "If they target Medicaid as part of entitlement reform," he says, that could be a deciding factor for many. Ron Pollack, of the consumer group Families USA, is even more emphatic about keeping Medicaid protected from cuts to preserve the health law's future. "If this budget negotiation results in reducing the Medicaid program, then I think that governors are not going to opt into this expansion," he said. "So it is now essential to protect the Medicaid program." That sentiment is hardly universal, however. 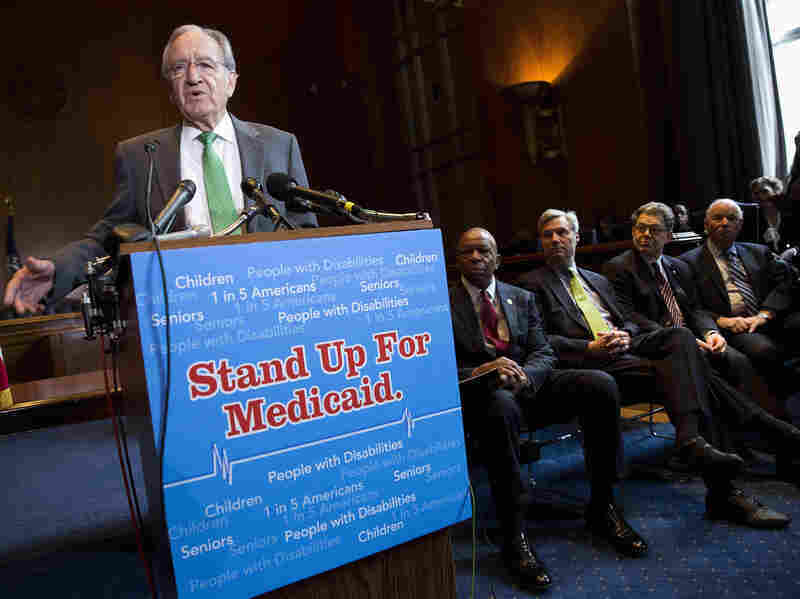 Merrill Matthews, a resident scholar with the conservative Institute for Policy Innovation, is one of many conservatives who think Medicaid needs a complete overhaul. "Although it's better than not having any insurance, it is bad insurance," he says of Medicaid. "And I argue that health care coverage for the poor shouldn't necessarily be poor coverage." All of which sets up just one more major area of disagreement as the clock ticks down on the budget negotiators.